Interests - Shopping, Theme Parks, baking and decorating cupcakes, making funny video clips, funky nail art and absolutely adores make up, especially MAC make up. Robyn is a wonderful, cheeky, toothless 7 year old girl, who in May 2009 was diagnosed with Neuroblastoma. As with many children with this cancer, it had spread by the time she was diagnosed, so her diagnosis is known as stage 4 – high risk. Robyn has responded really well to her treatment and her primary tumour in her pelvis was removed successfully in September 2009. Robyn is very beautiful, inside and out, and extremely active. She used to enjoy gymnastic classes with her cousins, dancing, and would ride her bike for miles. She loves Harry Potter, High School Musical and Lady Gaga. She has a strange liking for mini coopers – in particular, yellow ones. She loves Spongebob, animals, and the colour yellow. She also loves dressing up and much to her mother’s disgust – applying make up! Robyn would dearly love and appreciate receiving a letter from anyone who could spare the time to brighten up her day. I speak for every parent of a child with cancer when I say they are the bravest, most beautiful beings to walk this earth. The round of MIBG didn’t make any difference and Robyn was given her stem cells back to try and boost her blood counts but is still needing transfusions. Two weeks ago Robyn had a cycle of Zometa (good for long term bone pain) but it has caused very severe pain. She is on large amounts of Oxycodone and Fentanyl lozenges. If the pain is under control then she’s often asleep. Her pain was everywhere for four days, every bone, muscle and joint. Now it’s only in her right leg. 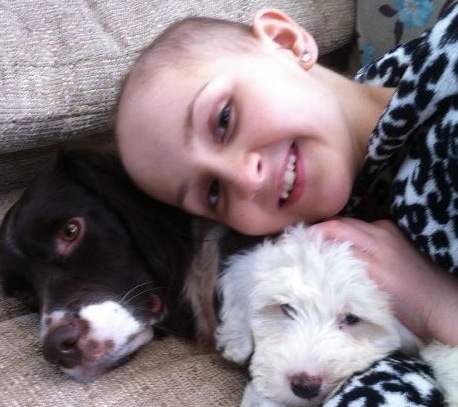 She has a medium size lump at the back of her head which she is having radiotherapy on and a second one also appeared. When she had the CT scan on the tumours she was struggling for air. Slight panic ensued and she was given oxygen for an hour. The cause of this was probably an increased dose of Oxycodone and her little body was protesting. This last week has been constant pain for Robyn with anger and tears. Then the odd hour of no pain with laughter, chatting and apologies. I cannot bear her apologising. Never should she have to apologise for her feelings and behaviour when she’s ill and in severe pain. She has been unable to walk any distance since Saturday, only to transfer from bed to chair. At 2am she walked down the stairs and ate a yoghurt and some cheese; she was delighted with herself. Thank you Postpals for Robyn’s balloon (Viks) and all the ecards she received (I recongnised a few names there! ), she had over 50. These cheered her enormously whilst having mibg therapy. We fly home tomorrow. Thank you! Robyn is currently an inpatient and the hospital have an Ecard system. Please send Robyn a cheerful note just by filling in the form here, the details you need are Robyn Higgins and Floor 4. Why not share your favourite joke or funny poem? 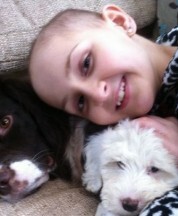 Robyn moved on from Post Pals in October 2010 as she had completed treatment and was NED (no evidence of disease). She worked hard to regain full mobility, went back to school, joined the Brownies and was enjoying life. Unfortunately in April 2011 scans showed that the cancer had come back, there were 2 small spots in her skull vault and a small amount in her abdomen, thankfully her bone marrow was clear. The UK only offer palliative treatment so her family turned to America for help. Robyn had her First Holy Communion (which had been arranged before her relapse) looking beautiful in her white dress and curly hair before flying out to Philadelphia to start intense treatment. Robyn remained in the USA for several months undergoing a tough regime of chemotherapy. Initially the area of Neuroblastoma responded to the chemo but later progressed, so Robyn was changed to a different type of chemotherapy. Robyn has had lots of different treatment on both sides of the Atlantic since 2011, some have worked better than others. Now, in 2013, Robyn has had 2 rounds of chemo in the UK and has just returned to America for another round of MIBG therapy. Robyn would love some cheerful post to make her smile. I think it is time for Robyn to move on from Post Pals now as she is currently well. I cannot thank you enough for all that Robyn has been sent. I cannot believe that people thought of Robyn when she needed them and I am amazed by the thought put behind the letters and gifts. Thank you everyone. Hi everyone. It has been a long time since I have updated you on Robyn and for that I truly apologise, but I think, looking back, I found certain things really difficult being so far from home. Anyway, Robyn underwent 5 months of antibody (immuno) therapy at The Children’s Hospital of Philadelphia and this was fairly harsh treatment. This was compounded by the fact that she had to attempt to learn to walk again in between treatment with intensive daily physical therapy. She did so very well and I am immensely proud of her. It is very scary being so far away from home with a seriously ill child but I would do it all again in a flash. We came home from The States on the 1st of June and Robyn attempted to try to return to school for 2 hours a day. She was still extremely underweight but we were continuing to build her up nightly via her NG tube. She can now walk really well albeit with a minor limp – now we just to teach her how to run. On the 7th July Robyn and I flew back out to The Children’s hospital of Philadelphia where she had received her treatment for her final scans and bone marrow aspirates. These eventually came back as ‘clear of cancer’ and we are all, of course, delighted. Although it has to be noted that Robyn’s scans have all been ‘no evidence of disease’ since November 09 and that although this is fantastic news, any Neuroblastoma family will tell you that this disease, in particular, is notorious for returning. So! While we were in America we lived at the Ronald McDonald house in Philadelphia, a wonderful house with even more wonderful staff and volunteers ensuring that families like ourselves with seriously ill children far away from the familiarity of their own homes were as safe, warm, fed and cared for as we could possibly be. Every morning when we came out of the lift into a beautiful hall there were pigeon holes with each family’s door number on. We were number 19 and number 19 was ALWAYS stuffed full of Post Pals post. You have no idea how special Robyn used to feel opening her post with all her little friends she had met. Also, on the days that she just couldn’t get up because she was feeling so weak, I would either coax her downstairs or bring it all up to her. Over the months that we were in Philly we must have had scores and scores of letters and parcels – and then Greg and Tommy would bring loads more with them from England when they visited! Robyn is very poorly at the moment. She is in hospital with shingles and has been for 2 weeks now. Sorry I haven’t updated her page, it is just that things have been so stressful.